A view over the courtyard of the main building in the castle complex. 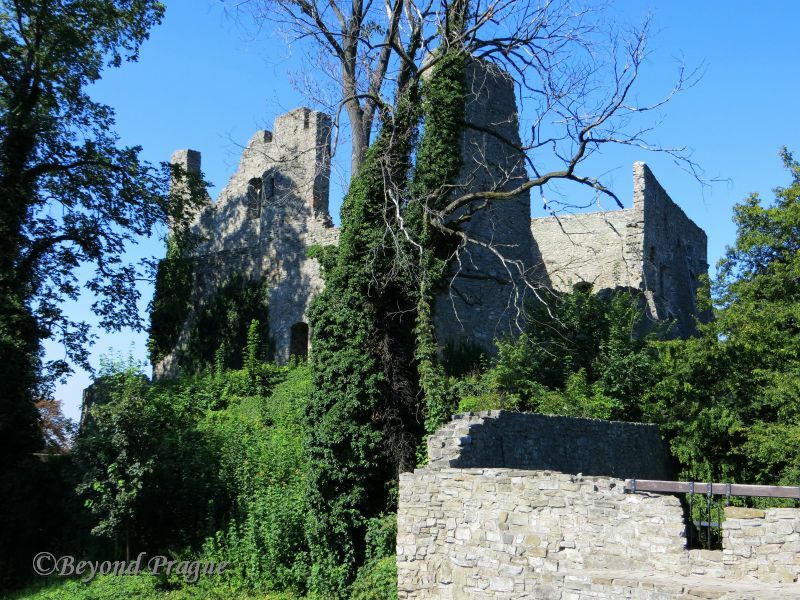 In the Beskydy mountains of Moravian Silesia, you will find the imposing ruins of Hukvaldy Castle. 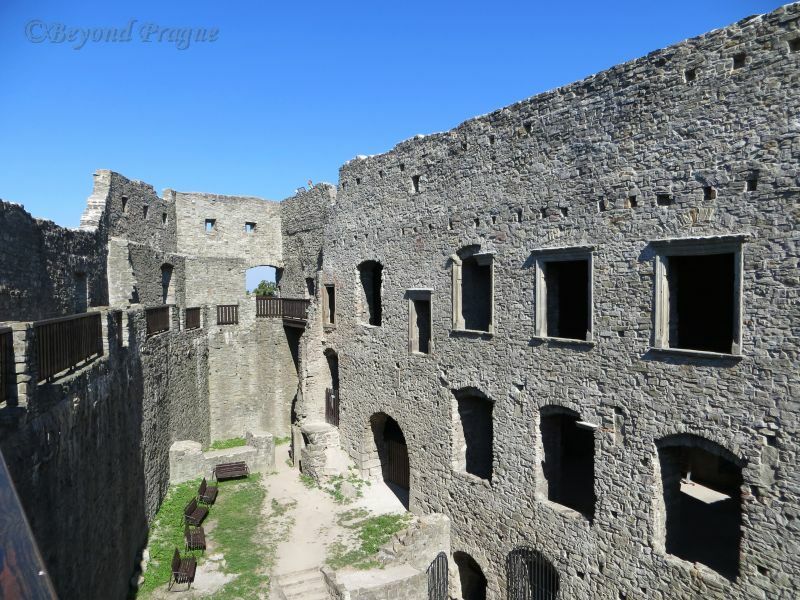 Hukvaldy is the second largest castle ruin in the Czech Republic and one of the largest in central Europe. Today, the preserved remnants of the fortress sit in the middle of a game preserve park populated by fallow deer, mouflon and many other varieties of flora and fauna. Famed Czech composer Leoš Janáček was born in the town which sits at the foot of the castle hill and shares the Hukvaldy name. The castle and its surroundings served as inspiration to Janáček and his legacy is honoured to this day through an annual music festival which takes place in and around the castle every summer. Looking over the moat and into the surrounding countryside from the main building. 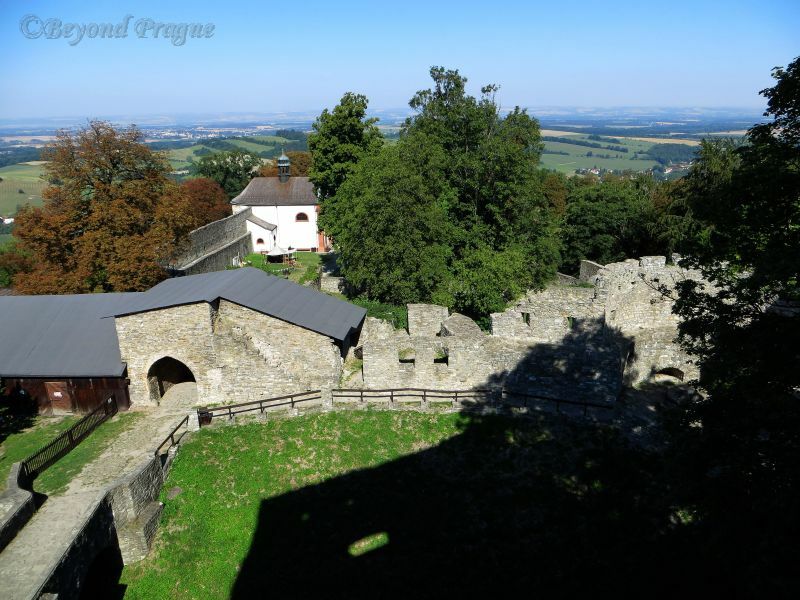 The castle dates back to the mid 13th century when it was established by the Huckeswagen family of Germany and stayed in their possession until the mid 14th century, when it was purchased by the Bishops of Olomouc. Financial issues in the Olomouc Diocese led to the castle being sold on through a series of owners over the decades until it briefly came back to Olomouc Diocese ownership in the mid 1460s. Through the latter part of the 15th century, the castle underwent major renovations under the ownership of the Lords of Boskovice. The Olomouc Diocese once more took possession of the castle in the early 16th century and held it until the castle was taken into state ownership in 1948. A section of the ruin seen from a look out point at one end of the complex. While surrounded by a lush game preserve today, the castle hill was devoid of trees in the castle’s active years. Any invader who wished to take the massive fortification would be totally without natural protective cover while making their way up the steep hill. Hukvaldy has the distinction of never having fallen to an invading force, this was due partly to its position on a steep hill and partly to it’s very heavily built nature. In 1626, During the 30 Years War, the Danish army laid siege to Hukvaldy for nine months with no success. What no enemy could accomplish from the outside, water supply issues did from the inside. Keeping the castle well full was a chronic problem at Hukvaldy and a very expensive one to contend with; a fire which destroyed the pumping equipment in the late 1730s marked the end of any further attempts to supply water to the castle and the beginning of its abandonment and decay. Nature dealt the final blow in 1762 when lightning struck a wooden structure and started a fire which gutted the entire castle and left it a true ruin. In the game park surrounding the castle. Hukvaldy is a well cared for historical site today with much to offer a visitor in atmosphere and in views of the surrounding countryside. A walk through the tranquil game park is an added attraction which should not be missed if the weather is good when you visit. 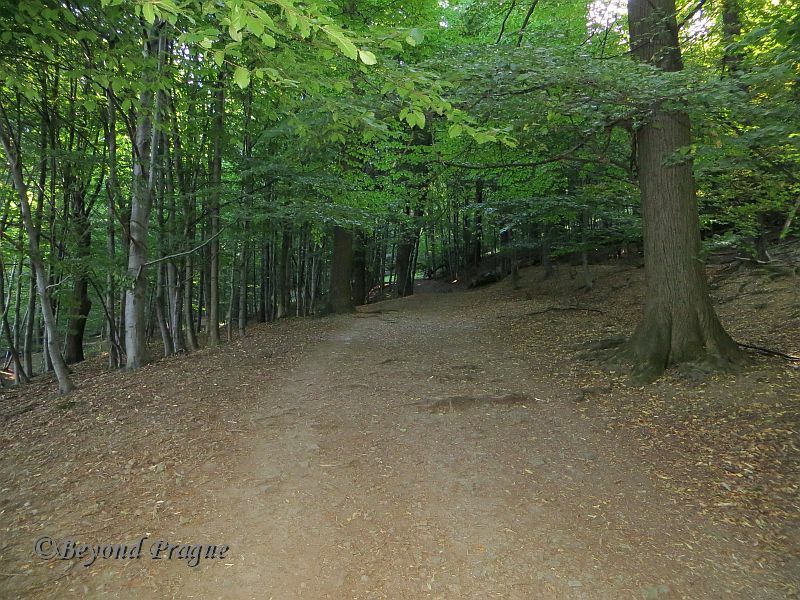 The town of Hukvaldy, at the foot of the castle hill, is pleasant and there are some restaurants and pubs where you can refresh yourself after visiting the castle and game preserve. If you are at all a fan of classical music, it is possible to visit Leoš Janáček’s birthplace in the town. An amazing site to see. I recommend and give it 5 Stars….